Welcome to Watch Surgery, where we provide professional, Watch Repair, Jewellery Repair, Engraving and Embossing services with very competitive prices. Our expertise, passion and extraordinary service backed with a workshop full of latest tools guarantees immaculate repairs everytime. 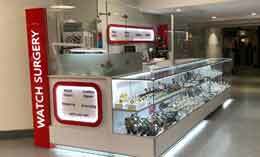 We are based in Central London and owned and operated by a family of watchmakers and jewellers. From the most luxury watch brands to fashion brands we deal with any watch. Battery replacement, movement servicing, glass replacement, engraving, polishing, strap replacement and much more. Gold, silver, platinum, palladium, alloy any metal we can repair. Regular soldering and laser soldering of chains, rings, retipping prongs, necklaces, earrings, bracelets, restringing and much more.